Wow! 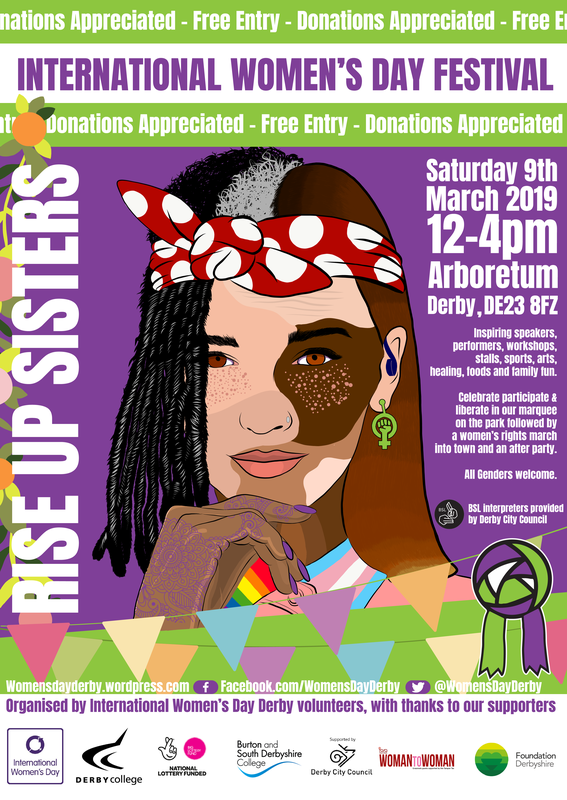 Let the history books record that on Saturday 9th March 2019 Derby brought many diverse local communities together to celebrate International Women’s Day with a buzzing huge marquee of performers, stalls and family fun on the Arboretum followed by a march through the city carrying HERoes from HERstory placards and an after party with She Speaks UK sharing a showcase of female and non-binary artists’ powerful poetry and performance and a female DJ to end the night with a Reclaim the Dancefloor disco. Your feedback helps us to secure funding, sponsorship and to keep making this volunteer-run festival happen each year – thank you! Look out for the craftivism zine we made with She Speaks UK at the festival too! 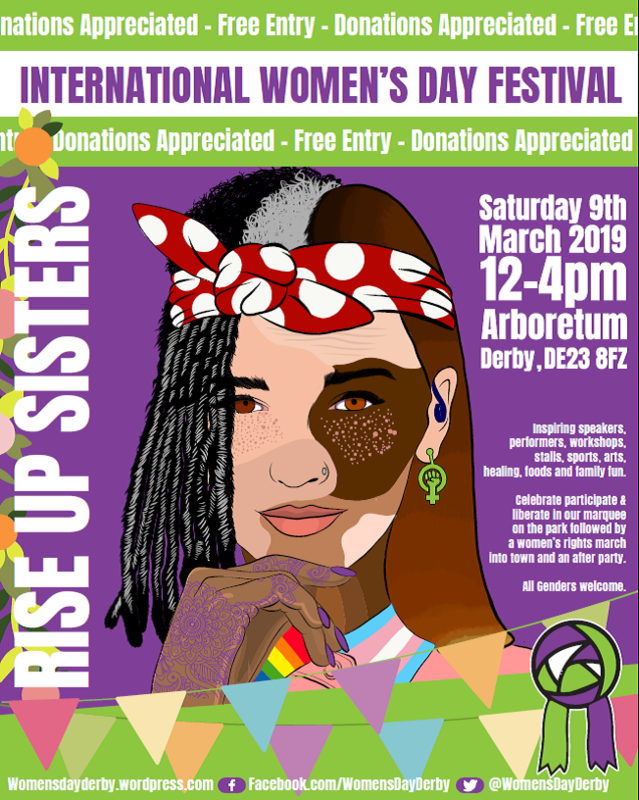 This Saturday 9th March 2019 Derby celebrates International Women’s Day with a vibrant FREE festival for the community, all organised by volunteers. Celebrations, performances, inspiring workshops, stalls, a Human Library, inspiring women in male dominated fields like engineers and fire fighters, food stalls and family fun can be enjoyed from 12pm-4pm at the Arboretum Park, Rose Hill Street, Derby under a huge marquee – see location map and bus routes below; street parking is available nearby but can get busy and Grove Street car park is close by. There will be a free creche from Orchard Garden Private Day Nursery you can contact them to book your little ones in for some fun time whilst you have some ‘me time’ by calling 01332 370497 or you can pop by on the day at the event, the creche will be in the building by the tennis/basketball courts; creche places subject to availability. There will also be plenty of family fun for kids to enjoy including a playbus, fire engine, crafts, nature activities, dance-alongs and a sensory bus too. Our volunteers have worked hard fundraising and planning all year to give Derby another uplifting IWD Festival – can you chip in to help us make more people feel great? Derby has a HERstory of celebrating International Women’s Day going back over 100 years to the Suffragettes in our city. Volunteers work hard to deliver this annual heritage event to benefit the community and we need your support to keep the tradition alive! This annual community festival makes a real difference in Derby. Visitors report benefits to their health and wellbeing, confidence, sense of empowerment and liberation; the event has inspired women and girls into new hobbies, sports, careers and activism, connected people with vital local support groups and charities as well as reducing loneliness by bringing communities together, celebrating diversity and broadening horizons. This year’s festival takes place on Saturday 9th March 12pm-4pm at Derby Arboretum followed by a women’s rights march into the city centre and onwards to an after-party from 5pm-11pm at Derby West Indian Community Centre with a mini ‘night market’ and She Speaks UK hosting powerful poetry and performances. Can you make a pledge to help us make more people feel like this? Images: The ‘Famous Women’ Pageant of the Women’s Coronation Procession, London, 17 June 1911. These Suffragettes, dressed as notable women from the past and carrying signs with their names, joined in the march and the rally in the Royal Albert Hall. The characters included writer Charlotte Bronte; Jenny Lind, the most celebrated soprano of her day; Grace Darling, a heroine who rescued survivors from a boat wrecked off the Farne Islands; Mrs Somerville, a science writer and advocate of higher education for women and women’s suffrage, after whom Somerville College, Oxford, is named. Ever wished you could find a women’s or girls’ magazine that was better than the usual stuff on the shelves? And with no air-brushing? Help us create one! A positive alternative magazine by the community, for the community! We’re inviting supporters – especially women and girls, across Derby & Derbyshire to contribute articles and poems to our International Women’s Day Derby Festival magazine which will be published online and also a printed version at our annual festival on 9th March. We cannot guarantee to print all submissions received but will aim to include as many as we can that are relevant. Non-commercial content is sought e.g. about causes, charities, inspiring women, gender equality, your favourite activist, women in science, girls playing rugby, etc – enjoy writing! #ExpressYouself Our priority is giving space for women and girls in Derby/shire but relevant submissions from allies of all genders welcome, content on intersectional feminism themes and trans inclusion and non-binary identity and men as allies would be lovely to receive too. Derby volunteers have been working hard all year on preparations for the uplifting annual IWD Festival for all the community to enjoy. Come along to Derby Arboretum 12pm-4pm Saturday 9th March 2019 to join the celebrations! Afterwards follow the Estrandosas drummers from the stage to gather and join us on a women’s rights march into town and then onwards to the after-party from 5pm at Derby West Indian Community Association, Trinity Street, with food stalls, entertainment and ‘night market’ then from 6.30pm She Speaks UK hosting a female-led performance night with powerful spoken word, open mic and a ‘reclaim the dancefloor’ disco with female DJ to end the night, closing at 11pm.